FRANKFURT -- Volkswagen AG said it still wants to keep its stake in Suzuki Motor Corp., declining to provide further comment after the Japanese carmaker on Friday accused it of breaching a partnership pact. "The discussion between both parties will be exclusively conducted internally," Volkswagen said in a statement on Monday. "For that reason, Volkswagen will not comment on any further speculation." A spokesman for Suzuki said the Japanese carmaker had not received any formal communication from Volkswagen on the matter. He declined to comment further on the VW statement. Suzuki has served VW with a notice of breach of contract, demanding the German company give it access to key technologies within weeks. Unless it does so, Suzuki's biggest shareholder must sell back its stake and quit the alliance, it said on Friday. 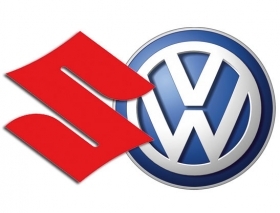 VW bought a 19.9 percent interest in Suzuki for about 1.7 billion euros ($2.4 billion) in January 2009. Suzuki took a 1.49 percent share of VW. Volkswagen said on Friday it might take legal action against Suzuki after the Japanese automaker served it with the notice of breach of contract. Last month, Suzuki chairman and CEO Osamu Suzuki offered to buy the shares VW holds, and in return, promised to offload its 1.5 percent stake, worth $1 billion, in Volkswagen back to its estranged German partner. Billed as a partnership of equals, the tie-up was meant to bolster VW's presence in India for small cars and give Suzuki access to technology it could not afford to develop on its own but the partnership has so far failed to deliver any meaningful cooperation.